If you spend any time online, chances are you’ve come across an infographic. Infographics are large visual images that represent data, statistics, or other information in a compelling way. Known for their ability to “go viral,” infographics are a popular link building tactic for many businesses. 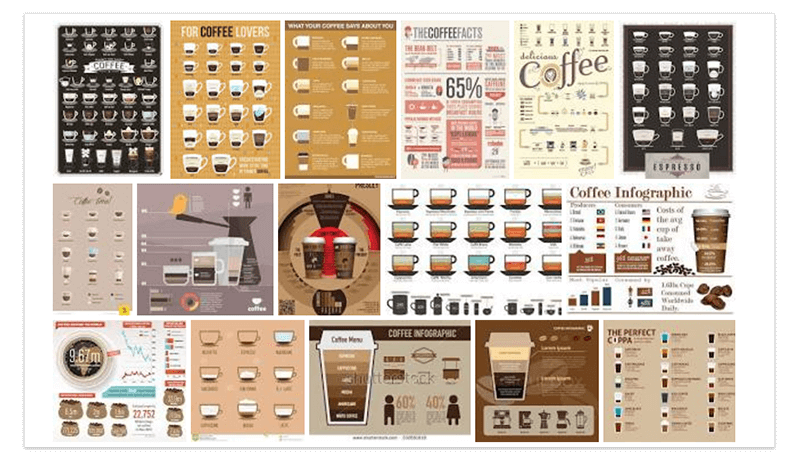 As you can see from the coffee-related infographics below, infographics can range in their content from lists to definitions to research and statistics. What they all share in common is their ability to catch your eye. This is why people like to reshare infographics on their blogs, websites, and social media channels. In fact, infographics receive 3 times the engagement of any other social media content, which explains why marketers are increasingly using infographics in their marketing. The use of visual content in marketing increased by 130 percent in just a single year (from 2015 to 2016). And marketers’ efforts are paying off. According to Unbounce, websites that publish infographics see a corresponding 12 percent growth in traffic, as compared to websites who don’t. Infographics are ideal linkbait because people are so willing to share them and provide a backlink as a citation. 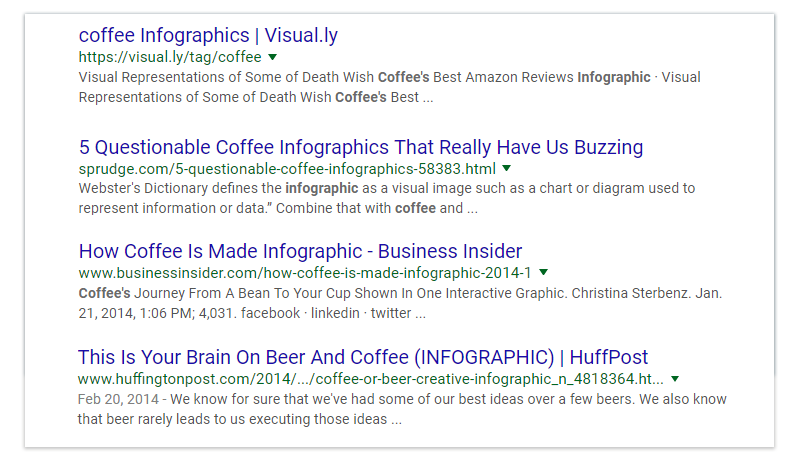 For example, take a look at the sites in the search results for “coffee infographic.” You see the usual culprits – Pinterest and Visual.ly – but you also see that coffee infographics have attracted the interest of both Huffington Post and Business Insider, two major publications with high domain authority. Infographics are incredible link building tools because they attract everyone’s attention, niche bloggers and mainstream media alike. Ready to get on board with infographic link building? As with any link-building campaign, you need to have a plan if you wish to be successful. Follow these steps to launch your infographic link building campaign. Ideally, your infographic should be relevant to what your business does. This way, the incoming links could bring potential customers to your website and Google will associate the infographic content with the rest of your website. Inspired by the coffee infographics above, let’s pretend we’re creating an infographic for a business that delivers coffee to corporate offices. Below are a list of common infographic topics – and how those might translate for our coffee company. Different “types” of characters Types of Office Coffee Drinkers: Which One Are You? When brainstorming your infographic, think about whether you have any unique research that you can share. Mine your own customer data if possible. If not, fortunately there is plenty of public data that’s freely available from Pew, Gartner, and government agencies. You could also use SurveyMonkey or Google Survey to poll your customers or social media followers and create your own data set. Once you have a few potential topics in mind, it’s time for a quick gut check. Before moving forward, you need to gauge whether there will be any interest for your infographic. Your infographic isn’t going to do much good if no one besides you finds it interesting. It’s important to at least get a scope of your target sites before you spend the time and effort designing your infographic. Start putting together a list of potential websites you can share your infographic with. Search Google and Pinterest first. Type in “[your infographic topic] infographics” and see what pops up. You can also browse an infographic directory like Visual.ly, and sort the results by the most liked or most viewed infographics. Open up a Google Spreadsheet and mark down which websites have shared similar content before. Are people sharing similar graphics already? That’s an indication people are interested in the topic. Is the market oversaturated? You want to find a happy medium between sufficient interest, and appetite for more information. Can you do it better? Arguably, this last question is the most important one. If you’re confident you can make a better infographic, you’ll have an easier time getting these people to link to your infographic instead. This can be especially sweet if you’re going after a competitor! Ideally, you’ll work with a designer to create your infographic. Designers are pros at matching color schemes in a visually appealing way, and mixing and matching graphics and fonts so that the final product looks professional. If you don’t already have an in-house design team, you can find a designer on a freelance site like Fiverr or UpWork. If you’re more of DIYer, sites like HubSpot and Canva make it easy to create an infographic yourself. Just enter your information into one of their plug-and-play templates and customize accordingly. The size should be 600-800 pixels wide, and no taller than 8,000 pixels (2000-3000 is a common height). Highlight the most compelling information with outlines, graphics, or larger fonts. Add supporting keyword-optimized content to the blog post, so that readers and Google get an idea of what the infographic is about. Use keywords in the filename of your infographic, and take advantage of the alt text. Don’t be shy about copying and pasting all the text from the infographic into the alt tag – this helps Google find your infographic and present it in Google Image Search for relevant search queries. Compress your image to under 1.5 MB. Users don’t like to wait around while a huge image loads. Once you’ve designed and published your infographic, it’s time to promote it. This is where the link building begins. First up, the easy links. There are many infographic directories where you can submit your infographic in a matter of minutes. Popular ones include Visual.ly, the Infographic subreddit, and Infographics Showcase. Many of these will give you a follow link for free. Share your infographic on all of your social media channels and include it in your next email newsletter. Your audience already follows you, so they’re primed to enjoy your content and reshare it – thus improving your chances of pickups by other websites. Reshare the post multiple times with the bite-size data points to lend variety to your social posts. If you have a WordPress blog, check out Sumo’s Image Sharer plugin. Whenever someone moves their cursor over the infographic, it will automatically present them with social sharing buttons. At last, here comes the real work. Review the list of websites you found in step 1, and begin email outreach to the author or editor. Search for other sites that may be interested in your topic using engagement software like Buzzsumo or Followerwonk. Keep your outreach email short and to the point. Personalize the email, both by addressing the person directly and by tailoring your pitch of why it would bring value to their audience. Make it easy for them to share by including the embed code. If any notable sites have already shared the infographic, mention them as social proof. Thanks for your information! We couldn’t have made our infographic without you. If your infographic is based on press-worthy, original research, you could also announce it via a press release to help it get picked up by journalists. As you perform outreach, you’ll want to keep track of which sites you’ve reached out to. Upload your Google spreadsheet into your link monitoring software so you can watch as they change from link targets into secured backlinks. Some recommended tools for this include: Ahrefs, Monitor Backlinks, Buzzsumo, and Mention. Next, you’ll want to perform a second round of outreach. A friendly follow up email may get you a few more links. Finally, perform a reverse image search in Google every 6 months or so. This will allow you to see if there are any new sites using your infographic without linking back. You can either upload the infographic image directly or enter the URL of the image file on your website. Google will spit out a list of sites which are using the image. Click through and send a friendly email to any that aren’t linking back to you. Thank them for sharing your infographic and ask if they wouldn’t mind giving you credit via a backlink. Be sure to include the embed code! Great content doesn’t promote itself. Design a linkbait-worthy infographic, and start sharing it via email, social media, and directories. Want help with the process? Contact us. We’ll review your content for infographic potential and manage the outreach and monitoring for you.